Cannondale Co2 cartridges are available in a 3 pack for better value for money. These are compatible with most Co2 mini pumps. 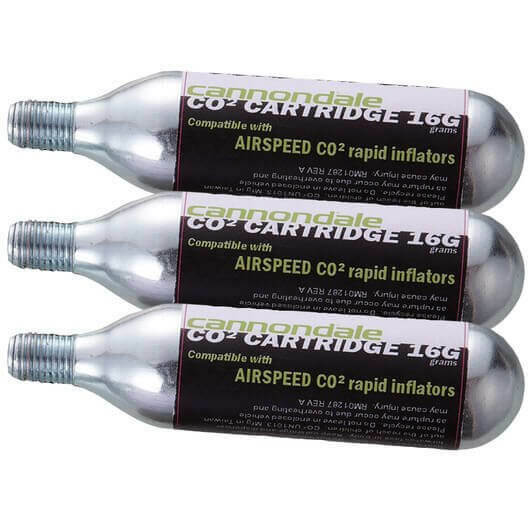 The Airspeed CO2 cartridge is designed specifically for cycling use, whether it's road cycling or mountain biking the Cannondale Airspeed Premium CO2 Refill pack 16g x 3 will work with your existing CO2 inflator to inflate your inner tube after any puncture repairs. These canisters feature a screw top, which is compatible with most threaded CO2 inflators.